The recorded voice that answers the phone at Acoustiblok Inc. in Tampa, Fla., speaks quietly. So does the chief executive, Lahnie Johnson, though Mr. Johnson says it is not by design. ''I wasn't really aware of that,'' he said, softly. But Mr. Johnson is in the business of thinking about sound, specifically how to reduce it. And the hotel industry has been turning to people like Mr. Johnson, whose company makes a range of sound-insulation construction products, because hotel guests are increasingly demanding a quiet night's sleep. 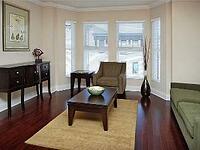 Hotel guests typically complain about things like poor service, dirty rooms and unreliable or costly Internet hookups. But a recent J. D. Power and Associates guest satisfaction survey found that customers said noise was their top concern in every hotel segment except the luxury niche. Even in the luxury segment, however, noise is an issue, especially as older hotels undertake renovations. ''Some hotels make the mistake of not even acknowledging to guests a renovation that is clearly going on,'' said Paul M. McManus, the chief executive of Leading Hotels of the World, an alliance of more than 430 luxury hotels. Older luxury hotels often were built ''like the Maginot Line, with enormous thick walls,'' Mr. McManus said. They were essentially soundproof. But when hotels add plumbing or wiring to a structure built like that, he added, they have a temporary noise problem that they need to acknowledge to guests and work on. Builders of hotels like the Four Seasons always consider acoustics and ''do things to a construction standard, with double-glazed windows, sufficient insulation in and padding on the walls -- even the grade of the carpeting has to do with it,'' Mr. McManus said. On the other hand, some hotels, especially in the luxury market, deliberately encourage the kind of bustle and excitement in lobbies and bars that can lead to noise seeping into guest rooms. But other less fashionable hotels have found it difficult to balance a thumping nightlife scene downstairs with the demands of guests upstairs who want a good night's sleep. One example is Shephard's Beach Resort, a hotel in Clearwater Beach, Fla., with a large and popular nightclub on the ground floor. 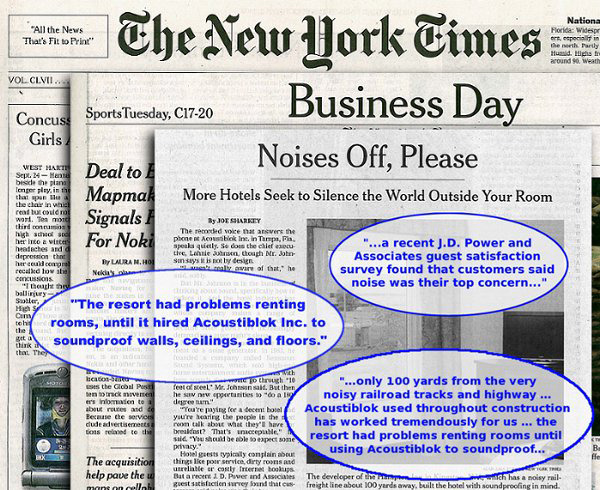 The resort had problems renting rooms on the first five floors because of the noise until it hired Mr. Johnson's Acoustiblok company to soundproof walls, ceilings and floors. ''They're now doing quite well,'' Mr. Johnson said. Acoustiblok says it is supplying its sound-insulation products for Trump Tower hotels in Chicago and Las Vegas and other major hotels, including an Intercontinental Hotel under construction in Pakistan. Construction techniques can dampen noise. But when other guests are generating a commotion, it can and should be addressed as a matter of basic social manners, said Susan Fitter, a consultant on etiquette who travels frequently to give seminars, usually in hotels. Being disturbed by loud talking, high-volume televisions and music and in-corridor rackets ''happens to me all the time,'' Ms. Fitter said. She said the hotels must ''take a position on the matter of guests being considerate to other guests, and to really respond to complaints.'' At the same time, she said, hotels can train employees to avoid making undue noise themselves, and to deal politely but effectively with loud and inconsiderate guests. Of course, one person's annoying noise is sometimes another person's basic routine, with no offense meant. Ms. Fitter said she recently took her daughters to their dormitories in separate colleges in Virginia and was amazed at what is considered a normal level of noise. 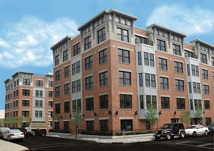 ''The dorms encourage the kids to keep their doors open. Yet the kids seem to be in bliss,'' she said. Given different notions of tolerance, ''We all can be taught new ways to show consideration toward one another,'' Ms. Fitter said. Jay Modhwadiya opened a Hampton Inn in June near a busy rail-freight line in Kingston, N.Y. He thinks that abatement is great, but prevention is more prudent. His hotel has eight-inch walls between rooms. ''We're only about 100 yards from the railroad tracks, and it's very noisy, very annoying,'' he said. Mr. Modhwadiya said he owned two independent hotels before building the Hampton, which is a midlevel brand in the Hilton chain popular with business travelers. He plans to build more. Mr. Modhwadiya said he used Acoustiblok products throughout construction, and ''it has tremendously worked for us'' in reducing rail and highway noise.